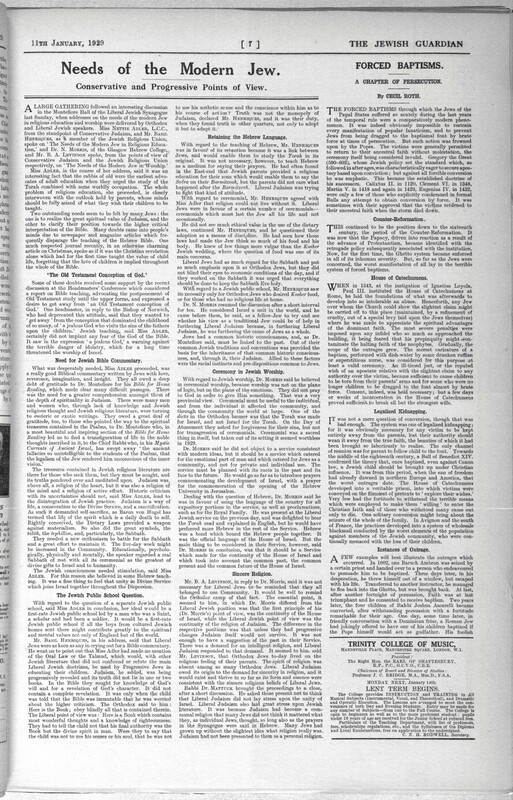 In June 1929, Father Arthur Day, an English Jesuit, the Vice-President of the Catholic Guild of Israel, and author of several booklets and articles on converting the Jews, published an article on the Mortara Affair in the The Month (the periodical of the English Jesuits): Arthur F. Day, “The Mortara Case,” Month, CLIII (June 1929): 500-509. 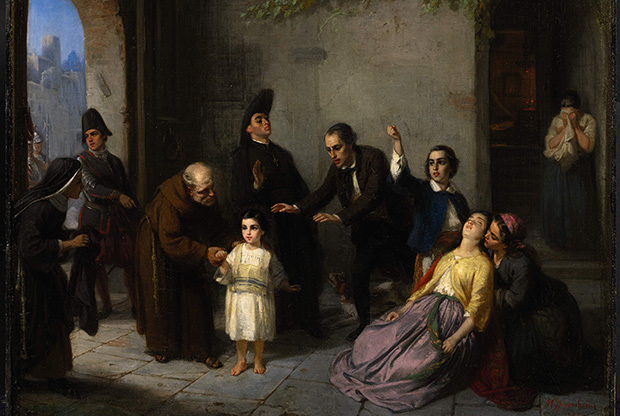 The Mortara Affair was an incident in which a six year old Jewish child, Edgardo Mortara, was forcibly removed from his family in 1858 by the Carabinieri (the military police of the Papal States), placed in the care of the Church, and later adopted by Pius IX. This was because a Catholic maid (Anna Morisi), afraid that Edgardo was about to die, illicitly baptised him – or at least claimed to have done so. Years later she revealed this to Father Feletti, the inquisitor in Bologna. The matter was referred to the Holy Office, which declared that the baptism was valid, and that according to papal law the boy must thus be removed from his family and brought to the House of the Catechumens in Rome. He was raised as a Roman Catholic and later became a Catholic priest. For a detailed examination of the Mortara Affair as it unfolded in the 1850s, see the following excellent book by Professor David Kertzer: The Kidnapping of Edgardo Mortara. For responses to the abduction in the English Catholic Tablet newspaper at the time, please see my blog post entitled “The Tablet and the Mortara Affair (1858)”. Father Day wrote his article about the Mortara Affair after a heated altercation on the subject of forced baptisms with the prominent Anglo-Jewish scholar, Cecil Roth, in the pages of the Jewish Guardian. Cecil Roth had presented a lecture at the Jewish Historical Society of England in December 1928 on “the Last Phase in Spain.” According to the Jewish Chronicle, Roth discussed the persecution of Jews in Spain at the end of the fourteenth century, the institution of the Spanish Inquisition, and the expulsion from Spain in 1492. Roth explained that a series of massacres in 1391 sapped the will of the Jews in Spain, and that “the number of those killed in these massacres was as nothing compared with the number of those who submitted to mass conversion in order to save their lives.” “Jewish History in Spain,” Jewish Chronicle, 14 December 1928, 10. Father Day attended Roth’s lecture and a heated debate apparently ensued between them on the subject of forced baptisms (according to the Jewish Guardian, Day raised objections to Roth’s “historiography”; Day denied this, stating that he was not “conscious of having objected to the lecturer’s ‘historiography,'” but rather simply asked Roth a “few questions” which “resulted in a friendly argument”). “Dr. Cecil Roth and Father Day,” Jewish Guardian, 28 December 1928, 12, and Letter from Arthur F. Day to the Editor, dated 31 December 1928, Jewish Guardian, 4 January 1929, 4. 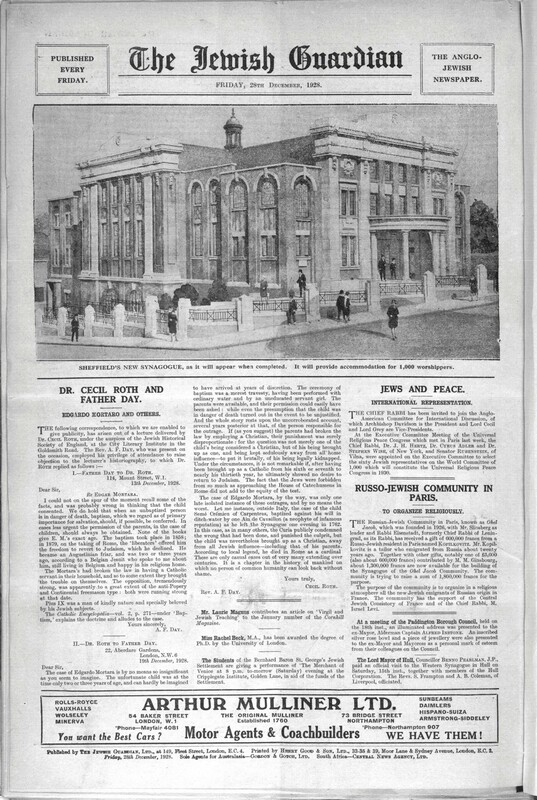 Jewish Guardian: 28 December 1928, p.12 and 4 January 1929, p.4. After the lecture, Day wrote a letter to Cecil Roth, dated 13 December 1928. His letter explained that whilst under normal circumstances (“cases less urgent”), the permission of the parents must be obtained before baptising Jewish children, in the exceptional circumstance in which “an unbaptized person is in danger of death, baptism, which we regard as of primary importance for salvation, should, if possible, be conferred.” Day argued that the Mortara family had “broken the law in having a Catholic servant in their household, and so to some extent they brought the trouble on themselves.” He also invoked a traditional anti-Masonic narrative, claiming that the opposition to Mortara’s removal from his parents was “to a great extent of the anti-Popery and Continental freemason type.” Cecil Roth subsequently published Father Day’s letter (without first asking Day’s permission) in the Jewish Guardian. Letter from Arthur F. Day to Cecil Roth, dated 13 December 1928, Jewish Guardian, 28 December 1928, 12. 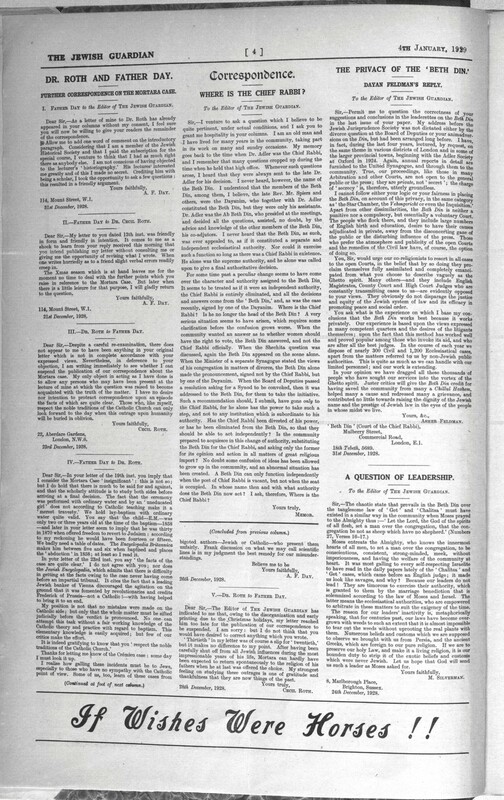 After Roth published Father Day’s letter, Day in turn published the rest of the correspondence between them (two letters from Day, dated 21 December and 26 December 1928, and two letters from Roth, dated 23 December and 28 December 1928) in the next issue of the Jewish Guardian. See “Dr. Roth and Father Day: Further Correspondence on the Mortara Case,” Jewish Guardian, 4 January 1929, 4. See also Letter from Arthur F. Day to the Editor, dated 14 January 1929, Jewish Guardian, 18 January 1929, 9. Roth was not impressed by Day’s arguments. In a letter dated 19 December 1928, he noted that the young Mortara was only two or three years of age at the time he was baptized, and that the “ceremony of baptism was a merest travesty, having been performed with ordinary water and by an uneducated servant girl.” In a letter dated 23 December, he stated that he had “no desire nor intention to protract correspondence upon an episode the facts of which are quite clear. Those who, like myself, respect the noble traditions of the Catholic Church can only look forward to the day when this outrage upon humanity will be buried in oblivion.” Whilst Father Day was eager to keep the conversation alive, Roth correctly observed that Day distorted the facts, and that there was therefore little to be gained in continuing the correspondence. After writing his own short essay on the history of forced baptisms and the Mortara Affair, published on 11 January 1929, Roth concluded with the following statement: “I have no intention to protract the correspondence upon this question between myself and Father Day. But it may be noticed en passant that there are curious discrepancies between the singularly unconvincing facts which he cites in the name of the Jewish Encyclopedia and what is to be found in the ordinary editions of that work.” Letter from Cecil Roth to Arthur Day, dated 19 December 1928, Jewish Guardian, 28 December 1928, 12; Letter from Cecil Roth to Arthur Day, dated 23 December 1928, Jewish Guardian, 4 January 1929, 4; Cecil Roth, “Forced Baptisms: A Chapter of Persecution,” Jewish Guardian, 11 January 1929, page 7 and page 8. 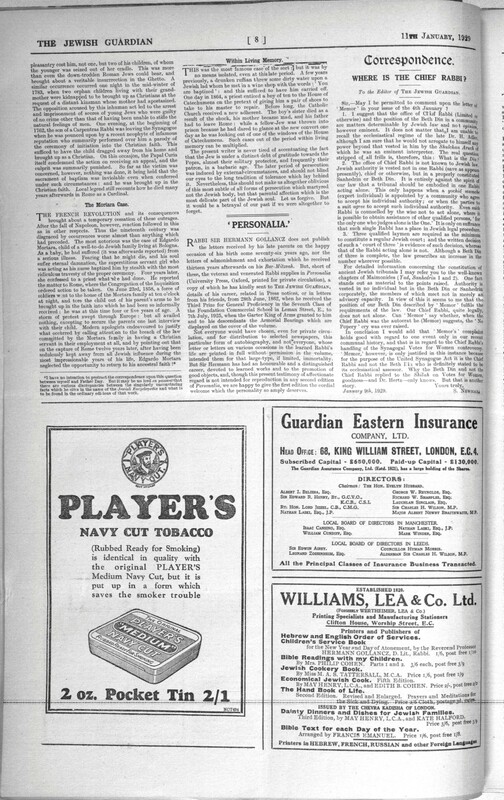 Jewish Guardian, 11 January 1929, pp.7-8. Day subsequently published his article defending the Mortara abduction in The Month in June 1929, informing his readers that it should not be “impossible for Jews to realize the importance we attach to baptism seeing that they, if at all orthodox, regard circumcision as a religious ordinance of the very first rank.” He rejected Roth’s argument that the baptism was a “ridiculous travesty,” noting that “it should occur to anyone at all experienced in historical research that the Sacred Congregation of the Inquisition is a fairly competent body which may be trusted to decide whether a clinical baptism has been correctly performed.” The crux of Day’s argument was that “if an infant is in serious danger of death, theologians teach that it should be baptised even without the consent of the parents.” He clarified that this “apparent overriding of parental rights” was explained and justified by the Catholic belief that “under such circumstances this sacrament is of eternal importance to the child, and to withhold it, when there is the opportunity of bestowing it, would be a violation of the law of charity.” According to Day, it is laid down as a “general rule” that in the instances where this occurs with “Hebrew infants,” with the child having been “validly” even if “illicitly” baptised, then they must be “separated from their relations and educated in the Christian faith. The parents, even though they may make promises, cannot be trusted in such a matter to fulfil them. The injury done to them is not so great as that which would be done to the dying child if the sacrament which opens heaven were withheld.” Father Day observed that “Dr. Cecil Roth persisted in inveighing against the inhumanity of the papal procedure and refused to consider what we might call for the moment, in deference to his view, the extenuating circumstances.” He described his “duel” with Cecil Roth as a “useful object-lesson regarding Jewish mentality when confronted by the Catholic claim.” As he had in his letter dated 13 December 1928, he suggested that the Mortara outcry and agitation was “set on foot” by “Protestants”, “Freemasons” and the “riffraff of the revolutionary parties.” Arthur F. Day, “The Mortara Case,” Month, CLIII (June 1929): 500-509. On 18 September 1929, Arthur day visited the nearly 80-year old Edgardo Mortara (by then Father Mortara, a member of the Canons Regular of the Lateran) at his “monastic home” just outside Liège. In 1930, he appended an account of this visit to the article he had written for The Month. This was published as a 28-page Catholic Guild of Israel booklet by the Catholic Truth Society. In this, Arthur Day observed that Father Mortara’s “buoyant and enthusiastic temperament is so prone to exult at the memory of the great deliverance and the many graces and favours that followed it, that it is not easy to get from him the sort of information that is dear to reporters. He is so full of fervour and fire that it is difficult for him to adapt himself to a matter-of-fact enquirer. Nobody could be more obliging: his Prior said to me of him, using a French proverb: ‘If it could give pleasure to anyone he would gladly be cut into four. '” Arthur Day recorded that Father Mortara told him that he became a member of his religious order early in his life because he felt that “God has given me such great graces; I must belong entirely to him.” A. F. Day, The Mortara Mystery (London: Catholic Truth Society, 1930), 17-19. He also wrote to Cecil Roth to present him with a copy of the booklet, and he noted at the end of the booklet that “it is pleasant to record that Dr. Roth … acknowledged the receipt of a copy in a kindly and friendly tone.” Letter from A. F. Day to Dr Roth, “Cecil Roth Letters,” 19 June 1930, held in Special Collections, Brotherton Library, University of Leeds, File 26220; A. F. Day, The Mortara Mystery, 28. In 1936, Cecil Roth published a book presenting a short history of the Jewish people. In this book, he mentioned in passing the Mortara Affair. He stated that in 1858, a “wave of indignation swept through Europe by reason of the kidnapping at Bologna (still under Papal rule) of a six-year-old Jewish child, Edgardo Mortara, on the pretext that he had been submitted to some sort of baptismal ceremony by a servant-girl four years previous.” In May 1936, Father Day was reported (in the Catholic Herald) as saying that “there is undeniably much anti-Christian and still more anti-Catholic bigotry among the London Jews.” He probably had Cecil Roth’s comments about the Mortara Affair in mind when he added that “in spite of appalling ignorance, they pose as competent critics of Catholic theology. The puerility of it passes comprehension; and yet it is among the intelligentsia that one finds the worst offenders.” A few weeks later, on 2 June 1936, Father Day wrote to Cecil Roth about his short history of the Jewish people, stating that he “found much to admire, but also some portions distinctly less admirable.” Unsurprisingly, the portions that Day found “less admirable” were those relating to the Mortara Affair. Day argued that “‘kidnapping’ is not the right word” because “at that time and in that place it was a legal act.” He also stated that the baptism performed by the young Catholic maid was “a valid clinical baptism” and “not a pretext.” It was, he suggested, not merely a pretext for abduction but a genuine reason. Cecil Roth must have replied to Day (letter not found), because Father Day sent him another letter on 10 June 1936, thanking him for acknowledging his letter. In this second letter, Day suggested that it was not a kidnapping because “the Oxford Dictionary … defines ‘kidnapping’ as ‘carrying off a child by illegal force'” (the emphasis by underlining was Father Day’s). Day concluded that “if a modern incident can be so maltreated, what about the poor old Middle Ages!” See Cecil Roth, A Short History of the Jewish People (London: Macmillan and Company, 1936), 378; “Jews and Christians: A Priest’s Experience,” Catholic Herald, 15 May 1936, 2; Letters from A. F. Day to Dr Roth, “Cecil Roth Letters,” 2 June 1936 (with attached note) and 10 June 1936, held in Special Collections, Brotherton Library, University of Leeds, File 26220. In 1953, Cecil Roth returned to the Mortara Affair. He noted that “Modern apologists endeavoured to justify what occurred by calling attention to the breach of the law committed by the Mortara family in having a Christian servant in their employment at all, and by pointing out that on the capture of Rome twelve years later, after having been sedulously kept away from all Jewish influence during the most impressionable years of his life, Edgardo Mortara neglected the opportunity to return to his ancestral faith.” Roth referred to the controversy with Father Day which began in 1928, observing that Day later wrote to him in response to his A Short History of the Jewish People (i.e. Day’s letter of 2 June 1936), “indignantly protesting against my statement that Edgardo Mortara was ‘kidnapped. '” Roth was understandably surprised and frustrated that Father Day believed it was in any sense a creditable defence of the kidnapping that the six-year-old Edgardo Mortara, as a result of being illicitly baptised as a baby by a servant girl, had been “removed from his parents’ custody by process of the law!” Cecil Roth, Personalities and Events in Jewish History (Philadelphia: The Jewish Publication Society of America, 1953), 273-274. As a postscript, according to reports on the internet, Kertzer’s book will soon be adapted into a movie by Steven Spielberg [link]..
By Simon in Anglo-Jewish History, Antisemitism, Catholic Guild of Israel, Cecil Roth, Jewish Authors, Jewish Guardian, Mortara Affair on February 23, 2014 .